Alien: Blackout has been officially revealed after months of title leaks and speculation, and it's far from the online shooter we've been expecting. It's a mobile horror game that stars Amanda Ripley, the main character of Alien: Isolation, picking up after her encounter with the alien on Sevastopol Station between the events of the first and second films. Alien: Blackout is coming to iOS and Android on January 24, and it won't be free-to-play. Huh! Blackout puts some new spins on the familiar first-person horror of Isolation. 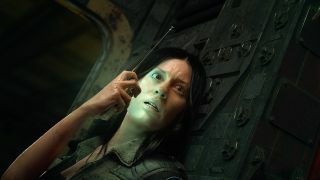 As Amanda, players must use a space station's damaged systems to guide her crewmates while avoiding the alien. Make a bad call and their deaths will affect the course of your seven-mission campaign. If you remember the control panel bits of Alien: Isolation, which let you divert power between nodes to create distractions, some of the game interface will look familiar. It appears that you can look and possibly even move around the station as Amanda. There are also controls for directing crewmates around the environment, or if you're like me, telling them to keep hiding while you try to figure out if that's the alien's "just banging around in the air ducts over here" or "definitely gonna drop down and kill you" behavior. ProTip: it's always whichever one you think it isn't. Amanda's still wearing her USCSS Torrens crew uniform in one of the screenshots for Blackout, so she's likely fresh off the Sevastopol when the story begins. No spoilers, but Alien: Isolation ended on a sudden cliffhanger, so hopefully we get some resolution there. Though to be fair, we did already know via an Aliens deleted scene that Amanda lived long enough to die of cancer at 66, so it's not like her ultimate fate was ever in question. Even if this wasn't quite what I had in mind for my next adventure as the daughter of Ripley, I'm interested to see what Blackout has to offer. You don't see many big companies making premium (AKA paid upfront) mobile games these days, and having a set, seven-mission structure that changes based on how much of your crew survives is thematically appropriate. Plus, Fox plans to tell more of Amanda Ripley's story across multiple mediums throughout 2019. Last but not least, Fox confirmed that the "massively multiplayer online shooter set in the Alien cinematic universe for consoles and PC" that has been half-announced for a while is still coming from Cold Iron Studios. It just isn't Alien: Blackout. Pique your interest for more space oddities with our list of the best sci-fi movies out there.